California tax revenue is running $2.4 billion ahead of expectations, but Gov. Jerry Brown cautioned Tuesday that the windfall would go to offsetting higher-than-expected health care costs and an underfunded teachers' pension system. In the revised budget plan that Brown released Tuesday, the governor projected $107.8 billion in spending from the general fund, the state's main account for paying day-to-day operations, bringing total state spending to $156.2 billion for the fiscal year starting July 1. That's $1 billion more than the general fund plan Brown proposed in January. An increase in tax revenue has Democrats in the Legislature demanding more spending to restore previous funding cuts to social services. However, Brown said California can expect about $1.2 billion in additional costs this year for Medi-Cal, the state's health insurance program for the poor, which saw 1.4 million more enrollees than the state projected in January. Brown's office said the additional cost will climb to $2.4 billion in the next fiscal year as even more people enroll due to an expansion under the Affordable Care Act. "People will say, 'You aren't spending enough on this program or that program, or helping low-income people.' California is going the extra mile in terms of health care," Brown said. The governor also set aside $450 million to help pay for the growing obligation of public school teacher pensions. The state Legislative Analyst's Office has estimated the liability is nearly $74 billion. "That was a commitment they made years ago, but they didn't pay for it," Brown said. 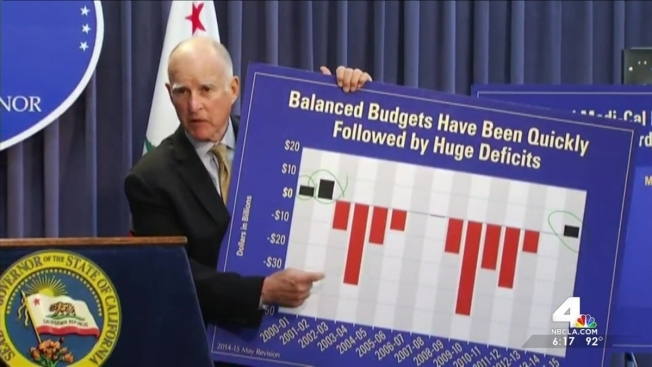 Brown's record-high spending plan will be debated in the Legislature. While the governor pleads caution with new spending, he has not let up on his campaign to use money from pollution credits to finance the building of the high-speed rail - which some Democrats, led by Lt. Gov. Gavin Newsom, now oppose. The budget also adds $142 million to address California's drought for expenses such as firefighting, emergency response, water management, wildlife preservation and food assistance, primarily for farmworkers who lose their jobs. The debate over spending priorities now starts in earnest, with a spending plan deadline of June 15.